Aubrey’s Traditional Creperie, Nottingham, is located in the lower end of the West End Arcade just off the Old Market Square. The entrance of which can be found opposite the central library. The West End Arcade is full of independent places offering a variety of things, so this is an ideal location for such a unique place. The venue is quite small as it only holds around 20 people in total, which includes some outside seating which is good as it is covered. Despite the size of the venue, there is a unique atmosphere as the tables are quite close together and you can see into the kitchen area, as it is open plan. This is great as it allows you to catch a glimpse of your crepes being made, as well as the fabulous smells as they prepare their wide range of delicious sweet and savoury crepes. The inside of the place is well themed with wooden floors, old wooden tables and chairs with thick woollen blankets. The walls are traditional bricked walls that are painted white. In addition to their menu offering a good amount of choice they also have their specials listed on a black chalk board inside. Many of the cups, plates and cutlery are also in keeping with the theme of the venue. Upon arrival we were seated immediately and the service was very quick and attentive throughout. We were given menus and they also pointed out that they had special galettes and crepes on their board too. Our drinks arrived quickly and our orders were taken at this time too. The service was fast again and each crepe only took around five to seven minutes to arrive. To gain more of an idea of the range of dishes that they offer I decided to have both a savoury galette and a sweet crepe. From the galettes I went for the salami and chilli, which consisted of sliced salami, melted raclette, chilli relish, rocket, oil and balsamic, £6.The galette is slightly thicker than a crepe and is made from buckwheat flour. Crispy around the edges yet still soft on the inside. 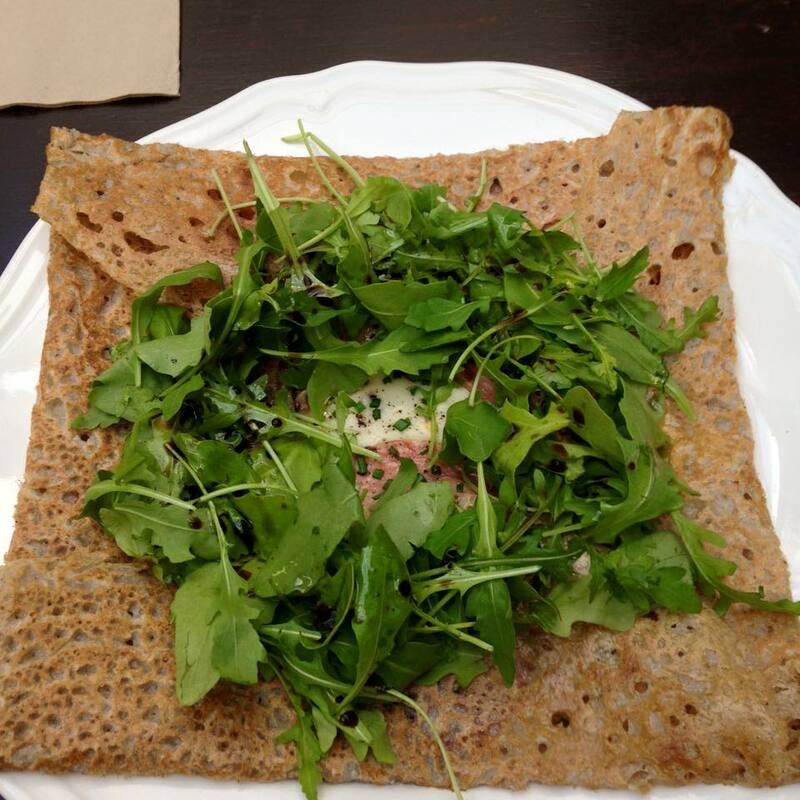 The rocket which was finely presented on top of the galette not only added colour but was both fresh and crunchy and the strong taste of the rocket worked well with the drizzle of balsamic. The cheese works well at combining the dish and again forms a good partnership in complementing the thinly sliced salami. It was layered very well as at the bottom of the galette you get the chilli relish that offers a kick to go with the creamy texture of the raclette cheese. Overall the galette was well presented and had sprinkles of finely cut chives to add more flavour and was finished with an even amount of each of the toppings. From their offering of sweet crepes I went for the caramelised apples, which consisted of apples cooked in butter, cinnamon and sugar, served with crème fraiche and honey. £4.75. 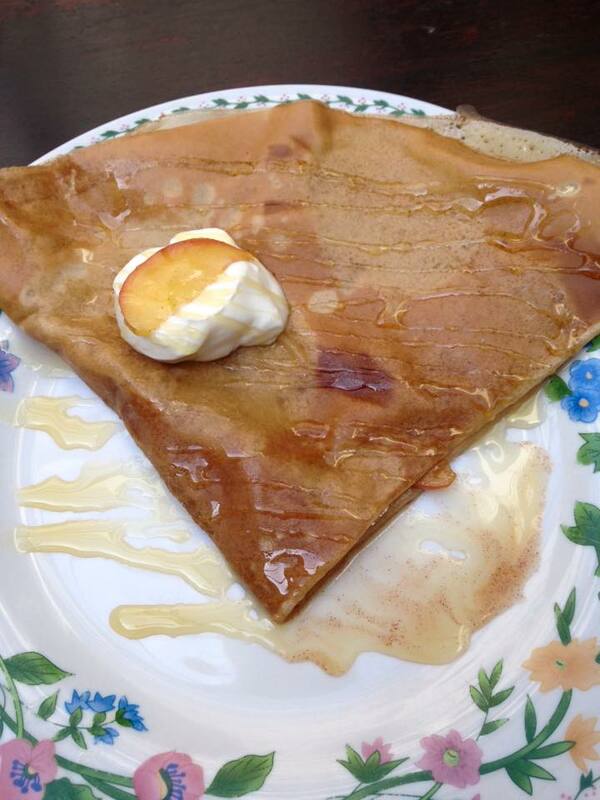 The crepe was thin and soft with crispy edges. The honey adds a nice sweetness to the crepe and also to the apples. The apples are soft and well cooked in the butter which of course works perfectly with the cinnamon. The slices of apple are a good size and although soft the skin is kept on to add to the textures of this dish. The crème fraiche adds a slight bit of sourness to the sweetness of the dish and is well presented with a dollop of it on top of a slice of caramelised apple. It also adds an element of cold to the warm dish. There is just the right amount of warm honey drizzled over the top which adds sweetness without making it overpowering. Overall, the service was good, the quality and presentation of the food was outstanding and I also felt that for a galette, crepe and a drink for £12.85, the prices were very reasonable too. The menu is well varied to meet the needs of both vegans and vegetarians along with a good contrast of ingredients depending of your taste and whether you prefer sweet or savoury items. The venue is in a great location for lunch whilst in the city centre and the portions are just right too. 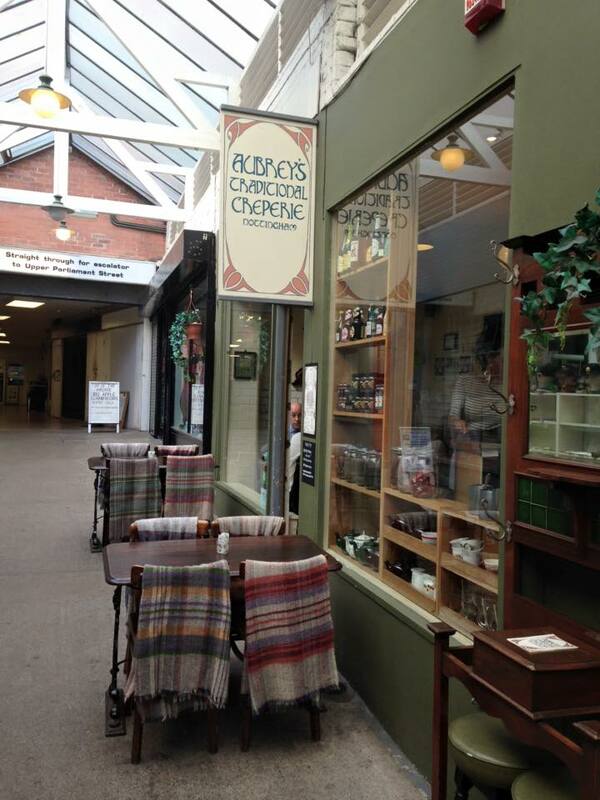 Location: Aubrey’s Traditional Creperie, 14-16 West End Arcade, Long Row, Nottingham, NG1 6JP.